Lewis Hamilton won the season-closing Abu Dhabi Grand Prix from pole, his 11th victory of his latest championship season. And as Martin Brundle noted, it's not clear if he broke sweat in so doing. There was the odd adventure along the way; the odd cause for doubt. But the running thread through all of the Yas Marina race was that Hamilton's Mercedes was well in the best place. It was 2018 in microcosm. The main detour was a result of Kimi Raikkonen's Ferrari stopping on lap 7 with no power on the pit straight. The Virtual Safety Car was enacted and Hamilton alone among the leaders took advantage of the lower time-loss by making his sole pitstop. He emerged in fifth, planning to run to the end and just 8.8 seconds off the new leader, his stable-mate Valtteri Bottas. Hamilton sounded sceptical at times but it did work out, as when others ahead pitted he had a net lead of something in the order of 10s. The only matter then was whether his tyres could go to the end. Or if the rain would stay away. Yes you read that right. What with us being in the desert most scoffed when a '40% rain chance' was communicated before the start, but just before half distance some arrived for a while. Given though where we were it just burned off the surface and intermediate tyre conditions never looked close. Bottas with fresher rubber ate at Hamilton's lead and got within 6s by around two-thirds' distance, but then his race unravelled. 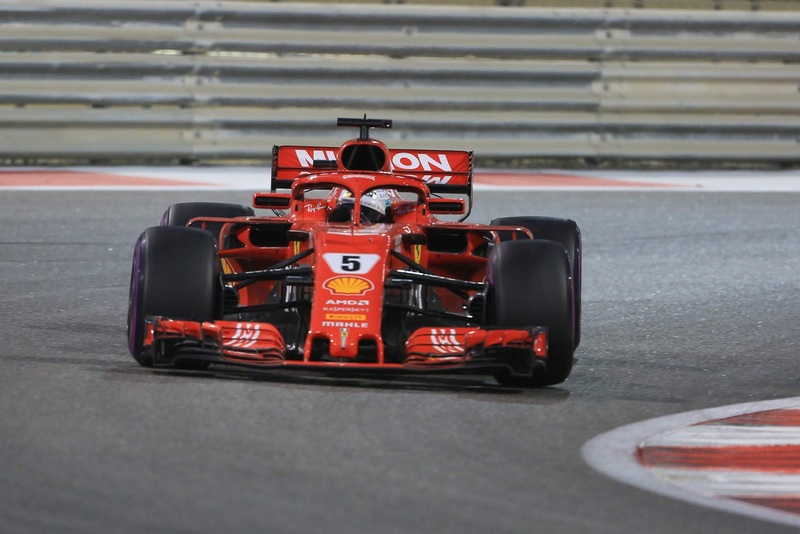 First he locked up and ran wide at the early-lap chicane letting Sebastain Vettel's Ferrari onto his tail at the worst moment, just before the long straights. Seb said thanks very much and took second place. Before we knew it, within a few laps, both Red Bulls were by Bottas as well, and the Finn had fitted in another excursion following a lock-up. 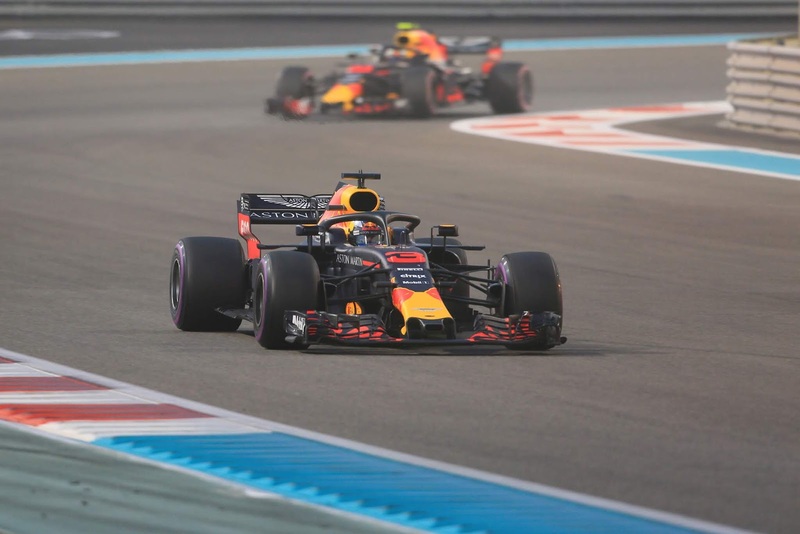 He then had a second stop for tyres - as the team was concerned about a slow puncture after Max Verstappen had given him a love tap on the way by - which dropped him properly out of contention and he trailed in fifth. "I want to have some time off and some time to think about things," Bottas said candidly afterwards. "Particularly, to me mentally, [a] pretty tough year - so I need some break." 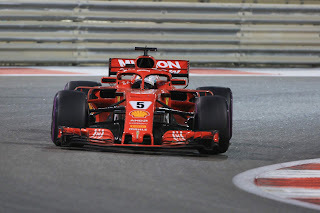 It also ensured Raikkonen's third place in the drivers' standings, which had looked vulnerable with his DNF as Bottas started the day 14 points behind. 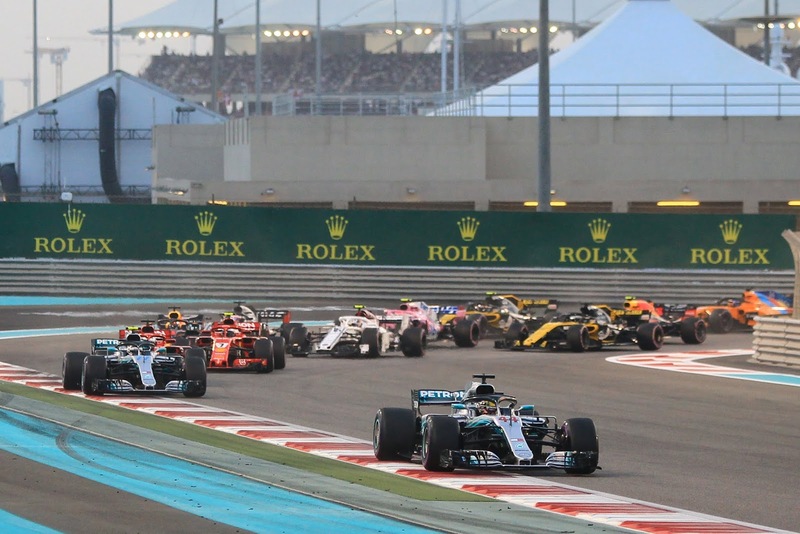 Bottas's decline left Vettel in the chief Hamilton chaser role, and he continued to nibble at the gap just as Bottas had. But Hamilton seemed happy enough keeping him at arm's length. Seb's second place though was a timely boost for him after a distinctly iffy latter part of the year. 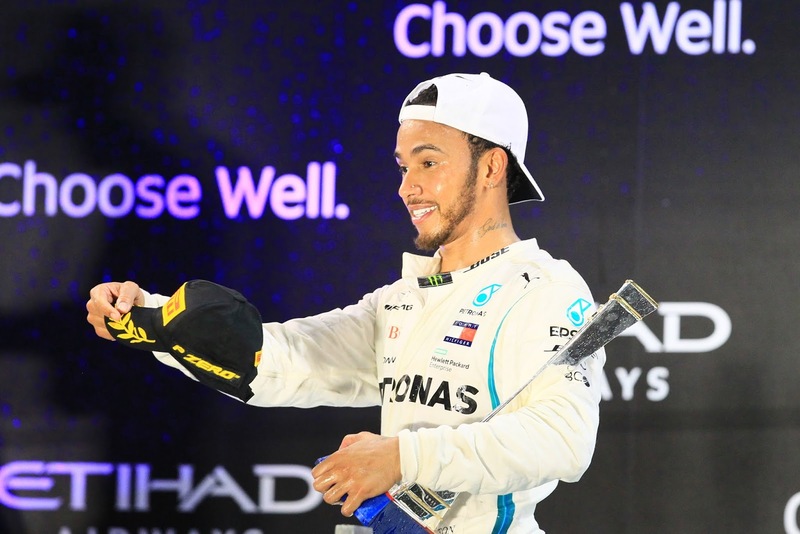 "I'm happy to finish on a high," Hamilton said. "Seb was driving really well through the race, putting in some great laps, and it got so tricky at the end with the wind, but I think it was the same for all of us. "Today my engineers always talked about stopping super early. They're way too chilled behind the wall! And I was like 'yeah, I've got a long way to and this doesn’t feel too good right now'. But it lasted long, once again they were calculated and correct and that’s why we have to put so much trust in those guys." Vettel also entered the microcosm theme. "Catching [Hamilton] a little bit, a little bit, but I think he controlled the pace at the front," he said. "I would have liked it to be a little more wheel-to-wheel but yeah, a long year, a lot of races. "I will try, we will try, I think our whole team will try to come back stronger to make sure we give him a harder run into next year." Verstappen completed the podium, with it himself getting within just two points of Raikkonen's third place in the table. Verstappen also got to the end with some adventures. His engine went into a 'safety programme' off the line with overheating and he dropped to ninth, and we had a curious situation in the early laps where he had the same problem on the first long straight especially. It righted itself pretty rapidly and before we knew it Max was his usual punchy self and among the leaders. Late on he said he struggled to see due to oil sprayed from Pierre Gasly's Honda engine ahead (more on that anon). One hopes for Max's sake it isn't any sort of portent for 2019. Next home was his Red Bull team-mate Daniel Ricciardo in fourth, who was another to provide a minor sub-plot. In his case - on his last run for Red Bull - he stayed out a long time before pitting and thus led for several laps. Some speculated that he would have a late blast on the gumball hyper-soft tyre. As it was when he pitted on lap 34 of 55 he bolted on the super-soft like everyone else. Some initial strong laptimes on the new rubber, aided by those ahead battling at that point, got him close at the back of the leading pack but he then fell into the pattern of those ahead. 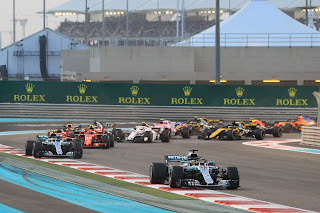 Charles Leclerc ran in fourth early in his final drive before his Sauber-to-Ferrari promotion, but pursued the same strategy as Hamilton's which didn't work for Leclerc as it tucked him up in the midfield train. He salvaged seventh, a place behind Carlos Sainz whose strategy was more conventional as he bid farewell to Renault with a strong result. Sergio Perez finished eighth while his Force India team-mate Esteban Ocon, who waves bye-bye from the F1 front line for now, would have followed him home but stopped with an engine problem with eight laps to go. He'd had some fun though and got a 5s penalty for passing Stoffel Vandoorne - another waving goodbye - with a turn wider the the curve. Gasly was also set to score on his last drive for Toro Rosso but had a Honda engine problem shortly after Ocon had his Merc one. It was a day for dropping out in your last race for a team, as Marcus Ericsson's Sauber also stopped at mid-distance, another who'd looked good for points. Which leaves the not inconsiderable Fernando Alonso, who also steps away - another for now at least. 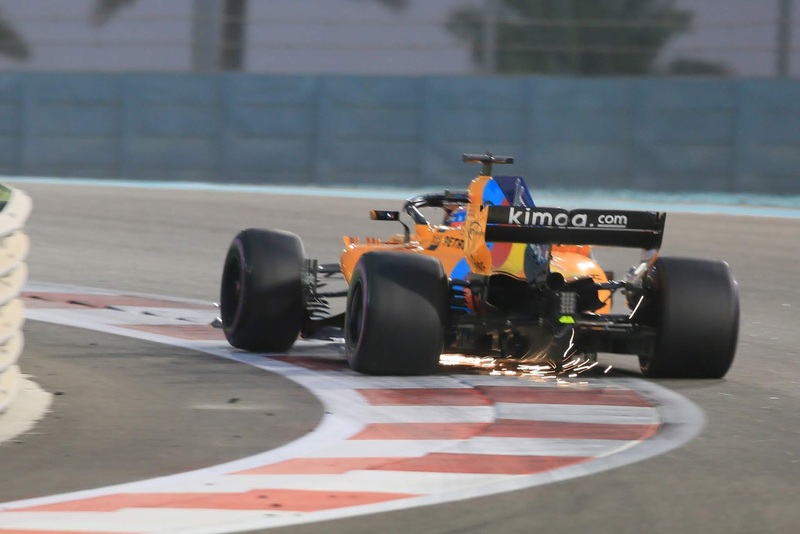 He came within one place of scoring on his farewell and indeed had a late charge at his former bete noire Kevin Magnussen to get it, but instead picked up 15s worth of time penalties for short-cutting bits of the circuit. He, hardly alone, seemed demob-happy.